"No one in our house sleeps through the night. We wake up to nightmares and uncontrollable tears." After pleading guilty but mentally ill Friday in the deaths of four people at a Henry County bonfire party in 2016, the defendant heard from families of the murder victims. Jacob Kosky confessed to his role in the murders on Friday, according Henry County District Attorney Darius Pattillo, saying he stole the guns used in the shooting. As part of the plea agreement, the district attorney agreed not to seek the death penalty against Kosky. According to prosecutors, on Oct. 26, 2016, Kosky and Matthew Baker Jr., both of McDonough, attended a bonfire at a home on Moccasin Gap Road in Jackson. At some point that night, the men exited the house and returned with guns and opened fire on the other guests, according to police. When police arrived they found four victims shot in the living room and kitchen. The homeowner was not there at the time of the shooting, but was on his way back from Florida. Destiny Olinger, 20, was house sitting and found inside the home suffering from at least one gunshot wound and in critical condition early the next morning. Matthew Hicks, 18, of McDonough, Keith Gibson, 29, of Covington, and Sophia Bullard, 20, of Thomason, were found dead inside the home. A week later, the Henry County Coroner confirmed that Olinger, the fourth victim, had died. The initial investigation turned up Baker and Kosky, but during the process of trying to find them, police uncovered three others who had some knowledge or direct involvement in the shooting. Police on the scene of a Henry County house shooting that killed three people. Family starts to arrive to the scene where four were shot, leaving three dead and one in critical condition. Four were shot inside a Henry County house, leaving three dead and one in critical condition around 2 a.m., Thursday morning. Baker was arrested at home after a felony traffic stop. Kosky was arrested on Jonesboro Road after he called 911 to turn in himself. According to the arrest warrants, Kosky and Baker went to a home to "rob and murder," and that Koksy shot all four victims in the head. Baker was charged and accused of "holding one of the firearms used" in the crimes and "giving said firearm to Jacob Koksy," according to the affidavits. 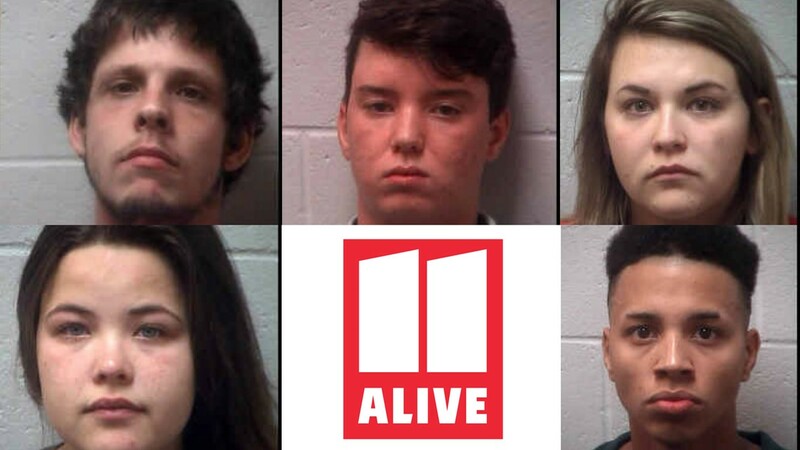 The other suspects, 18-year-old Jacob Williams of McDonough, 21-year-old Kayla Head of McDonough and 19-year-old Brooke Knight of Locust Grove, were arrested and charged with obstruction of a police investigation. In January 2017, a grand jury indicted Kosky and Baker with multiple counts of malice murder, felony murder, aggravated assault and possession of a firearm during the commission of a felony. Kosky was also charged with possession of a firearm by a convicted felon and felony theft by taking. New documents in Henry Co triple murder investigation: Matthew Baker, above, held the gun, as Jacob Kosky went to home to "rob and murder." New documents in Henry Co triple murder investigation: Jacob Kosky, above, went to home to "rob and murder" and Matthew Baker held the gun. Prior to sentencing, the court heard from families of the victims. "There are no pretty words to take away the pain, loneliness and fear that are now our world,' said Lori Hicks, the mother of Matthew HIcks. "No one in our house sleeps through the night," Lori Hicks said. "We wake up to nightmares and uncontrollable tears." She said that Kosky had shown no remorse for the murders. "I ask if at all possible, he be allowed no visitations. If I am not allowed to see my son, is it wrong for the same of his mother?" Mark Hicks, the father of Matthew Hicks, described his son a "miracle baby" who grew into a caring young man who wanted to major in sports medicine to help others. "I haven't lost anything -- it was taken from me, and there's a big difference," Mark said. Mark said his son ran a soup kitchen out of his home to help other students. Mark Hicks said he won't see his son grow up, get married or have children of his own. The father said he couldn't forgive those responsible for taking his son away. John Bullard, the father of Sophia Bullard, was next. "My daughter was executed, face-down in the prone position...I can't even begin to imagine what those last few seconds were like under those horrific circumstances," John Bullard said. Bullard argued that Kosky deserved the death penalty. "If this would have been your daughter, how would you feel?" Barbara Olinger, the mother of Destiny Olinger, then took the stand. "The heartache of losing my daughter is incomparable to any pain that I've ever experienced," It's as if a piece of my heart has been ripped out of my chest and there's nothing but a hole there that can never be filled," said Barbara Olinger. "She had her whole life ahead of her and in a matter of seconds, it was snatched away from her," Olinger said. Prior to sentencing, Kosky's defense attorney, Brad Gardner, went into details of Kosky's documented history of mental illness. He detailed Kosky's childhood, saying his mother had sought mental health help for her son at a young age. The attorney also spoke of a suicide attempt by Kosky when he was 15, and subsequent coma. Gardner said that school officials noted that he had lost some of his mental faculties after that. Kosky began experiencing hallucinations and hearing voices after that, the attorney said. Kosky was diagnosed with bipolar disorder. and was later committed to a mental hospital. He was later diagnosed with schizoaffective disorder. The attorney went on to describe several other stays at mental hospitals and described the voices that Kosky heard as "getting louder". In the weeks prior to the bonfire shooting, Kosky had been released from a mental institution without medication, Gardner said. During an Oct. 20, 2016 intake, Kosky reported voices and hallucinations, the attorney said. He was self-medicating by "taking other people's medications", the attorney said. The attorney blamed "a gap in the system" for allowing Kosky to remain out without his medications in the time when the shooting occurred. "Mr. Kosky just wanted me to relate that he's sorry," his attorney said. With the possibility of the death penalty taken off the table, the judge said he was left with two sentencing options: life with parole or life without parole. He sentenced Kosky to life without the possibility of parole. Baker's charges are still pending and he's scheduled to be prosecuted at a later date.